of ranking, or our propensity for ordering complex variation as a gradual ascending scale. Metaphors of progress and gradualism have been among the most pervasive in Western thought . . . ranking requires a criterion for assigning all individuals to their proper status in the single series. And what better criterion than an objective number? . . . one number for each individual . . . to rank people in a single series of worthiness, invariably to find that oppressed and disadvantaged groups — races, classes, or sexes — are innately inferior and deserve their status. In short, this book is about the Mismeasure of Man. The Great Chain of Being is a hierarchical worldview developed in mediaeval and Renaissance times but originating from Plato and the neoplatonists. In this view, everyone and everything has its place. An eagle is superior to the “worm eating” robin; the lion is superior to the domestic dog or cat; but those furry familiars have warrant to lord it over the wolf and rabbit because of their greater utility to Man. In other words, according to this view, Man is the paragon of animals, but is himself subject to the authority of angels and Heaven. All shall be well if each being in the Great Chain knows its place and does its allotted duty. I believe that the Great Chain of Being is an enduring but largely unconscious idea: we notice its presence like a fish notices the presence of water — that is to say, not at all. Our continuing propensity for ranking is a comfortable habit of thought that, regrettably, all of us slip into as easily as a favourite pair of slippers. reification, or our tendency to convert abstract concepts into entities (from the Latin res, or thing). We recognize the importance of mentality in our lives and wish to characterize it, in part so that we can make the divisions and distinctions among people that our cultural and political systems dictate. And so it continues. For example, Regional Schools Commissioner Dominic Herrington recently wrote to a school to ask for evidence that at least 80 per cent of teaching at the school “is rated to be good or better”, including in English and maths (Schoolsweek.co.uk 6/11/15) — to my mind, demonstrating the fallacies of both ranking and reification simultaneously. For goodness sake, not even Ofsted does that anymore! However, the practice is, I suspect, still common in a large number of schools as part of their appraisal systems i.e. if you don’t get a “1” or a “2” in any one of your lesson observations then you “fail”. The depressing truth is that even when Ofsted change their collective mind about an issue in response to evidence and reasonable argument (Yay! Go edu-bloggers! ), their previous ideas and systems continue onward with almost undiminished energy, seemingly with a life and mind (or non-mind) of their own: Zombie-Ofsted, if you will. To be fair to Ofsted, they have attempted to lay these walkers to rest by publishing clear and unequivocal guidance about their expectations about such nonsense as “minimal teacher talk” or “every lesson must include group work” and so on, but even such a well meaning stake-through-the-heart has made seemingly little headway against the strong winds of the Great Chain of Being. 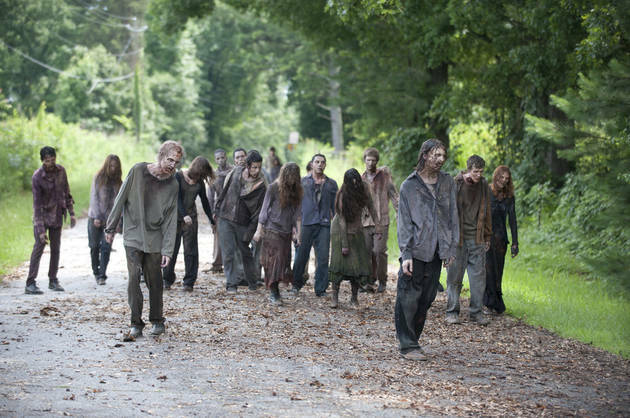 Zombie-Ofsted marches, or lurches, ever onward. Like so much else in the crazy world of education these days, it makes the mind boggle. Or curdle. Or both. [T]he community suffers nothing very terrible if its cobblers are bad and become degenerate and pretentious; but if the Guardians of the laws and state, who alone have the opportunity to bring it good government and prosperity, become a mere sham, then clearly it is completely ruined. — Plato. The Republic 421a (Penguin Classics) (Kindle Locations 2815-2817). Penguin Books Ltd. Kindle Edition. However, I think his statement about the Guardians of the state stands. Equally so with the state-appointed guardians of education: Ofsted. I think Professor Coe (http://www.bbc.co.uk/news/education-24079951) has done the education world a huge service by pointing out that the Ofsted king has no clothes. However, perhaps in the manner of scrupulous academics everywhere, Professor Coe might prefer a more nuanced “the king probably doesn’t have any clothes”. I don’t know about anyone else but I am staggered by this. As a working teacher who is just about maintaining a precarious foothold on the treacherous scree of middle management, I always thought my seniors and betters had reams of evidence supporting the stuff they were asking us to do. And if they didn’t, well probably their seniors and betters did. To hear a respected academic say that classroom observation might be “the next Brain Gym” was shocking. Claim X is therefore, true. Bennett, Bo (2012-02-21). Logically Fallacious: The Ultimate Collection of Over 300 Logical Fallacies (p. 82). eBookIt.com. Kindle Edition. Let’s see what Wilshaw said again. The inspectorate’s judgements make a huge amount of [presumably positive] difference. Ofsted judgements show that more schools (9 percentage points!) are good or outstanding. …therefore Ofsted judgements make a huge amount of positive difference. Now please note that this does not necessarily mean that the conclusion (that Ofsted helps schools improve) is false, but merely that the argument put forward by the Chief Inspector to support that conclusion is fallacious. And it hopefully goes without saying that a fallacious argument is by definition invalid and must be dropped immediately.